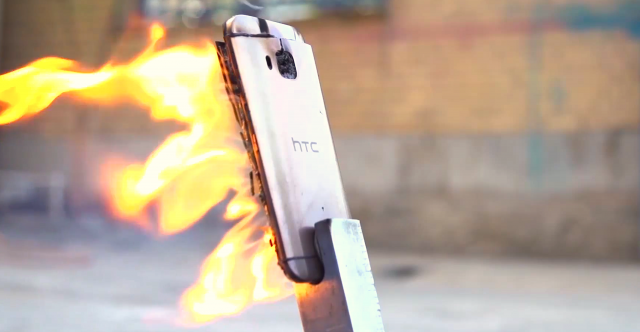 Home > HTC > HTC One M9 vs Flamethrower – Round 1 – Fight!!!! Let’s admit it guys, whenever it comes to doing drop tests for most flagship devices we do expect the next one to be more brutal and extreme than the previous one…isn’t it ? By now we have seen almost everything (much to the dismay of many people) including SUVs being driven over them or a 6 inch nail being hammered on top of the screen to a more subtle plain and simple drop test. This time around though, the guys at Digiato decided to go a little further with a brand new HTC One M9. Download The Official Real Madrid FC App now on the PlayStore - Hala Madrid!